Almond pancakes are delicious, healthy, gluten free, and full of protein! A combo of almond flour, extract, and milk really brings out the almond flavor! Almond, almond errrrything! Almond has got to be one of my favorite flavors, hands down, no competition. Growing up I was obsessed with bear claws, almond cookies, almond anything really. My mom makes a homemade pastry every christmas known as Kristina Kringlers. The tastiness of this treat combined with the scarcity of being a once a year delicacy might be to blame for my almond lust. Kristina Kringlers are essentially two layers of flaky pastry with almond custard-like filling in between and a thin almond glaze on top. They. Are. To. Die. For. I eat about 10 of them every christmas morning. Although I look forward to those every year (yes even at the tender age of 31), I still crave that flavor here and there and need a way to get my fix. A way that won’t leave me in a christmas morning food coma. I am normally more of a savory breakfast gal. Give me a potato hash skillet or eggs any day. I mean I love sweets through and through, but when I’m ravenous an hour after a pancake breakfast, that says something. I hate to call them out like this, but most sweet breakfasts are complete junk food. Welllll, problem solved with a stack of almond pancakes. There are over five grams of protein per pancake! Yeah, you heard me right, FIVE. If you eat two with a piece of fruit on the side, you’re set up for a few hours. Plus, the protein isn’t some kind of processed powder, its almond meal and almonds are great for you. Almonds are full of fiber, magnesium, and vitamin E. This makes them great for your hearts and bones. With the rate of osteoporosis and heart disease in this country being what it is, I’m sure we can all use a little help there. I’m not a gluten free eater, but these almond pancakes are naturally gluten free so they’re perfect for anyone with Celiac disease or gluten sensitivities. They’re dairy free too so the lactose intolerant crowd can thank their lucky stars. And for the rest of us who couldn’t give two sh*ts about any of this, the recipe is tasty as can be so don’t go judging these gluten free, dairy free pancakes before you try them. Yes, I heard you judging through the computer screen. Its an intuitive sense us bloggers have. Like spidey sense but more targeted toward predicting eye rolls and scoffs. If you simply can’t stop hatin, I’ve got a yogurt pancake recipe that is high in protein and pretty gosh darn fantastic too. Oh, and did I mention you dump it all into one bowl? No sifting flour and mixing in two different bowls like a chump. Just dump it all in, whisk, and pour. Just about the level of difficulty I want for a Sunday breakfast. There is really no way of making syrup healthy, but adding a touch of it to the batter sweetens the pancakes enough that I find I don’t need as much poured on top. Buy the good stuff too people! Good syrup is worth a few extra bucks. And how about that pour shot? 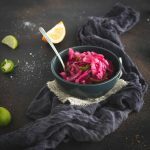 For any other ammeter food photographers reading this, Lindsey on Pinch of Yum has a great tutorial on this. I bought a new tripod a while back that is pretttty much my new bestie for things like this. Now what are you waiting for??? It’s Sunday morning! Go make yourself some pancakes! Start heating frying pan or griddle over medium heat. Stir almond meal, baking powder, salt, and cinnamon, together in a medium sized bowl. Add eggs, almond milk, maple syrup, almond extract, and coconut oil and whisk until just mixed and most lumps are dissolved. Don't add the hot coconut oil directly onto the eggs. either pour this in first and loosely mix it in or pour it into the other side of the bowl. Melt additional coconut oil on preheated pan or griddle over medium heat and spread out using a spatula. Ladle about ¼ cup of the batter onto the griddle and let cook until bubbles form. * Repeat to fill griddle. Carefully flip each pancake using a thin spatula. Let cook 1 more minute on other side or until lightly browned and then remove from heat and set aside while cooking the remaining pancakes. The recipe makes about eight pancakes. *If you're not sure if the temperature is right, you can make a mini test pancake to make sure. Just spoon or pour a small amount of batter onto the pan, about enough for a 1 inch pancake. If it browns too quickly, it is too hot and you will need to turn down the heat. If it takes over 3 minutes for bubbles to form and the pancake to be ready to flip, it is not hot enough.